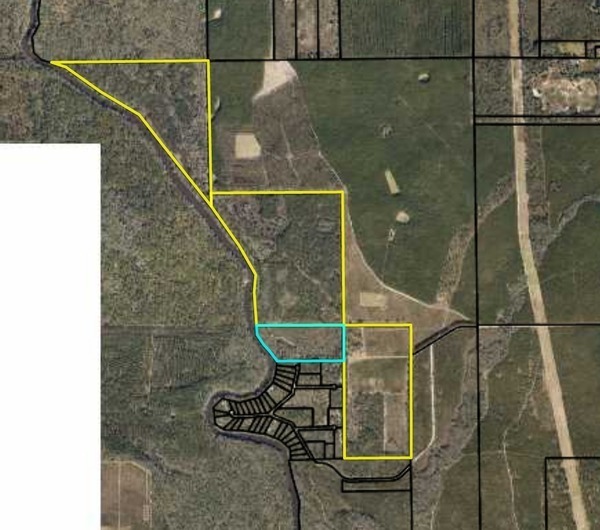 SELLER: River Error Farms Inc.
ACQUISITION PLANNING STATUS: This parcel is in an identified project area in the Withlacoochee East Conservation Area. TRACT DESCRIPTION: District property managed as part of Twin Rivers State Forest adjoins River Error Farms on both its north and south ends. Pine plantation stands of longleaf, slash and loblolly pine occupy 171 acres. The balance of the tract is in a mixed pine hardwood forest with strands of natural timber along the river and several sloughs. Hardee Spring (also known as Rosseter Spring) is a second magnitude spring which is deeply set into the banks of the river and flows for roughly 120 feet along its shallow run to the Withlacoochee River. Hardee Spring has a measured flow of 14.8 cfs or 9,600,000 gallons per day. A rustic lodge built in the 1930’s sits about 75 feet from the spring pool. ACCESS: Access is by county graded road. MANAGEMENT ALTERNATIVES: The property would be incorporated into the existing Twin Rivers State Forest. Primary management assistance would be provided by the Division of Forestry. All that flood plain may help explain why the property does not seem to be selling commercially: all of the riverfront is in the 10-year flood plain, and all but one of its four parcels are almost entirely in the 100-year flood plain. Four parcels of River Error Farms, Inc. in Hamilton County Property Appraiser. 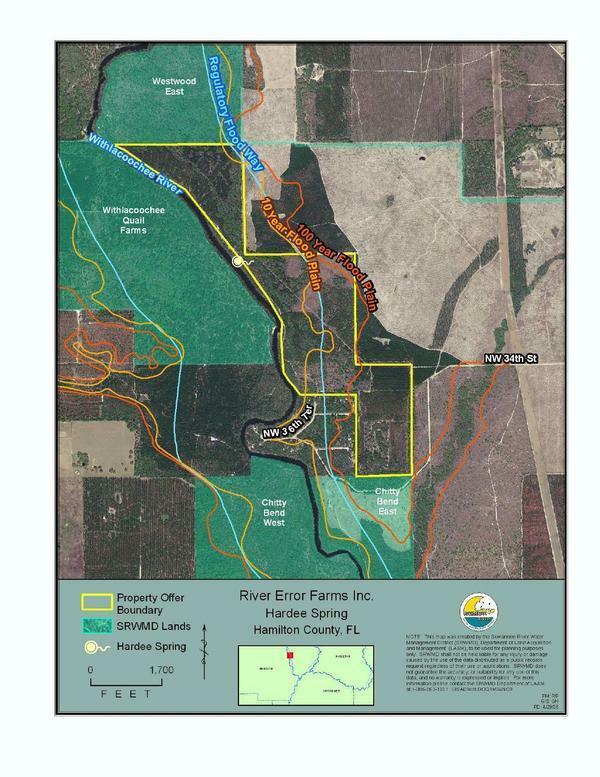 River Error Farms, Inc. filed an annual report with the Florida Secretary of State in January 2017, and Hamilton County Property Appraiser shows no sales, so apparently this property is still available. Parcel 4940-000 (77.5 acres), which looks like it has the spring and the lodge on it, has location address “2000 34TH ST NW, JENNINGS 32053”. The single family dwelling on this parcel built in 1945 is apparently the lodge, with 1,880 square feet, 1,728 heated. Parcel 4941-000, inland behind the subdivision. www.hardeesprings.com [That domain no longer has a website, unfortunately. 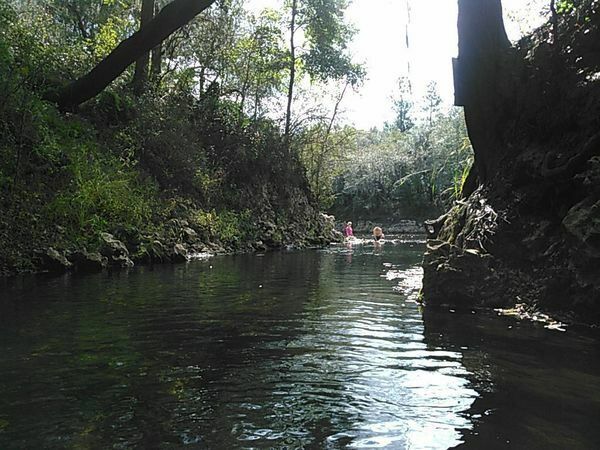 -jsq] Hardee Springs is an amazing beauty & a crown jewel of the Suwannee River Basin. The property has 305 acres with 8,000 feet of river frontage, associated to the 1st magnitude Blue Spring, an authentic lodge, and countless opportunities for investment and recreational possibilities. An overwhelming presence of wildlife pervades the 305 acres. Hardee Spring and Plantation’s serenity and natural beauty is the crown jewel of the Suwannee River Basin. The property has 305 acres with 1.6 miles of river frontage, a natural 1st magnitude spring, an enchanting lodge, and endless opportunities for investment and recreational possibilities. An overwhelming presence of wildlife pervades the 305 acres. The plantation is full of lush long leaf yellow pines, loblolly pines, stately live oak trees and other native flora and fauna such as black bear, deer, turkey, quail, and dove. The plantation is also part of the “Suwannee River Wilderness Trail”. The property is capable of accommodating various public uses including a state park, geological site, environmental attraction, ecological preserve, wildlife sanctuary, or nature focused recreational retreat with swimming, spring diving, canoeing, camping and fresh-water fishing. The property is equally attractive as a long term investment for future development as a water bottling production plant or nature conservancy holding. Hardee Spring and Plantation is 1 of 4 springs with a water use permit application (#WUP08). The spring has a flow of 17.6 million gallons per day and is on the “A List” of Florida’s 1st magnitude springs for purchase. It is one of the 21st Highest Acquisition Priority Group A projects. The rustic residence was designed by Governor Hardee and includes 5 bedrooms/ 4 bathrooms with native materials encompassing 2275 square feet of heated and air conditioned space. The fireplace is the central feature of the great room and brings to the whole structure a warmth and familiarity conducive to building greater bonds of friendship in an ever more complex world. For all this serenity and natural beauty you are nestled in the nearby communities of Tallahassee, FL, Jacksonville, FL, and Valdosta, GA. Whether you are enjoying a sunny afternoon kayaking down the Suwannee River, swimming in the spring, hiking the “Suwannee River Wilderness Trail”, or hunting wilderness, you will lose your heart to the beauty of this romantic, richly layered plantation and spring. The world of Hardee Spring and Plantation offers one a fuller, deeper, wealthier world. It’s also on the WWALS Withlacoochee and Little River Water Trail, in addition to the Suwannee River Wilderness Trail. And we’ll probably do it again! Thanks to Aaron Sirmons for the simple question that led to this long post.